I grow Eranthemum pulchellum in light shade, it has not performed well in direct light away from the coast. The ovate dark green leaves have white veins and small teeth. The true blue flowers come on terminal racemes. Eranthemum pulchellum is in bloom from April to hard frost. 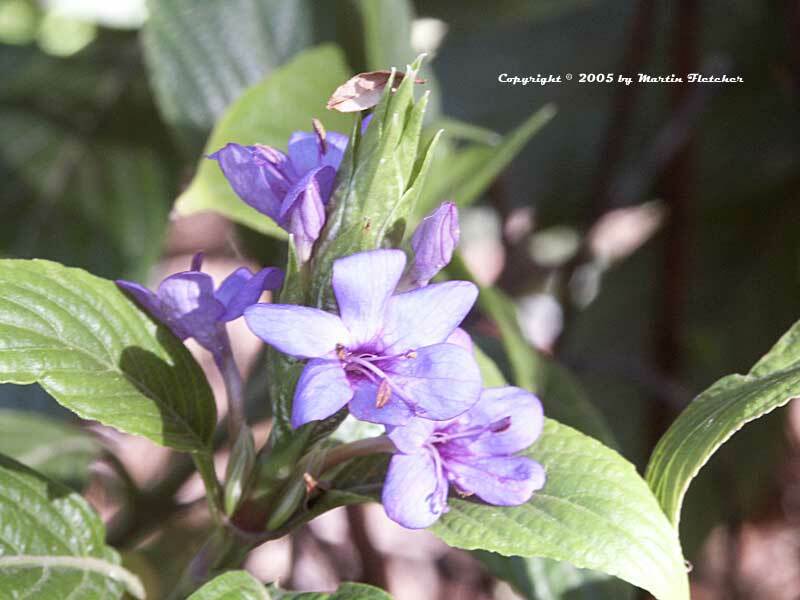 The Blue Sage is a native of India. After a season or two each of the branches dies back to the soil line. If conditions are reasonable numerous new shoots come up. Eranthemum pulchellum survived my dog digging a pit in the middle of the clump. The roots sprouted where they were exposed. There was some question as to whether the dog would ever return to my good graces. The Blue Sage eventually recovered and so have my feelings for the dog. He found a new patch of dirt to disturb. Blue flowers of Eranthemum pulchellum - Blue Sage. High resolution photos are part of our garden image collection.